The Commonwealth of Pennsylvania is the 6th most populous state in the U.S. and covers a very large geographical territory stretching westward from the Delaware River all the way to Lake Erie. Pennsylvania's large land area is traversed by more miles of roads and highways than any other state on the East Coast and the 11th most in the country. These roadways and the vehicle traffic on them range from congested urban sprawl around Philadelphia and Pittsburgh to rural farmland in places like Lancaster County. The roads and highways in Pennsylvania are also somewhat infamous for being poorly maintained. The Keystone State consistently ranks at or near the top of the Wall Street Journal's annual States with the Worst Roads survey. The most recent WSJ report ranks Pennsylvania as 10th worst with almost 30% of its public roadways in "poor condition." These roads accommodate a large volume of vehicles. There are 4.6 million registered vehicles in Pennsylvania, 5th most in the U.S.
With 4 million vehicles and 250,000 lane miles of road crossing through diverse geography, Pennsylvania sees literally hundreds of car accidents every day. Anytime someone is physically injured in a car accident they may be legally entitled to financial compensation from the at-fault driver. This page will review: (1) Pennsylvania auto accident statistics; (2) Pennsylvania law on auto accidents and insurance; and (3) the value of auto tort injury cases in Pennsylvania based on recent settlements and verdicts. The number of auto accidents occurring in the Commonwealth of Pennsylvania is somewhat staggering. Over the last 5 years an average of about 125,000 auto accidents are formerly reported to police in Pennsylvania each year. This means that 350 car accidents are getting reported each day. That's 15 accidents per hour and this doesn't even include minor accidents that are not reported to police. About 1,100 people are killed in Pennsylvania auto accidents each year which equates to 1 traffic fatality every 8 hours. Another 80,000 people are physically injured in traffic accidents on Pennsylvania's roadways every year. Based on current population this means that 1 out of every 159 residents of Pennsylvania will be injured in a car accident each year. As the chart above clearly illustrates, fatalities are a rare occurrence in a car accident. Only about 1% of Pennsylvania traffic accidents result in death. 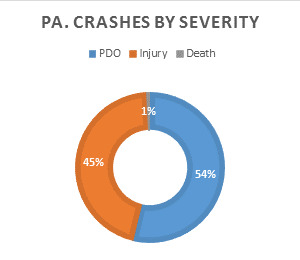 Almost half of all reported auto accidents in Pennsylvania do involve some type of physical injuries. Most auto accident injuries are classified as minor but a significant percentage of traffic injuries are classified as moderate to serious. Auto tort cases in Pennsylvania are shaped by 2 separate sections of state law: (1) traffic rules (i.e., stopping, speeding, yielding, and driver's exam stuff); and (2) laws on car insurance and who is financially responsible for an accident. Below is a brief summary of these various laws in Pennsylvania as they apply to auto accident cases. Pennsylvania is an optional or "choice" no-fault insurance state. When Pa. drivers get car insurance they can choose between no-fault or standard policies. With a no-fault policy, your damages for smaller accidents are directly covered by your own insurance company. This saves time and hassle because there is no investigation into who was at-fault. With standard policies coverage is provided by the at-fault driver's insurer. The statute of limitations on auto tort lawsuits in Pennsylvania is 2-years from the date of the accident. Pa. Code § 5524. So if you are hurt in a car accident you will need to sue the driver within 2 years or you will lose the right to bring a claim. There are 2 exceptions to this 2-year limitation that are worth mentioning. First, if a child is injured in a car accident the 2-year limit on their individual claim doesn't start until they turn 18. Second, if the at-fault driver is a government employee you will need to send written notice of your potential claim within 6 months. In most auto accident cases one driver is clearly and fully at-fault for the accident. For instance, if someone runs a red light and hits you they are 100% at fault. There are some accident situations, however, where both drivers are partly to blame. Pennsylvania applies the rule of modified comparative negligence in these cases. Under this rule the jury allocates fault between the parties: Driver A = 20% at fault … Driver B = 80% at fault. Then the total amount of monetary damages gets divided based on these fault percentages. So in our example above if the jury awards $100,000 in damages, Driver A would only get $80,000. The damages get reduced by his 20% share of fault. One of the primary things most people take into consideration when deciding whether to pursue a lawsuit or injury claim after a car accident is how much their claim might be worth. The best way to get an idea of the typical value of auto tort cases in Pennsylvania is to look at reported settlements and jury verdicts in other recent car accident lawsuits. Kody v Encompass Ins. (Pennsylvania 2018) $800,000: woman is in the valet parking line at the Seasons 52 restaurant in King of Prussia when she gets violently t-boned by another driver. She suffers numerous injuries including cervical disc herniations which require spinal fusion surgery; a severe concussion; PTSD and occipital neuralgia. Her claim against the at-fault driver quickly settles for policy limits of $45,000 and she pursues an uninsured motorist claim for her remaining damages. Case goes to trial after her insurer rejects her UIM claim insisting that her injuries were pre-existing and adequately covered by her settlement with the other driver. A jury in Montgomery County ends up awarding $800,000. Le v Smith (Pennsylvania 2018) $70,000: 55-year-old woman is stopped in the toll both line at the Walt Whitman Bridge when she gets sideswiped by defendant who is hauling a boat. She alleges 3 bulged / herniated discs in the lumbar area of her back which are confirmed by MRI and require surgery. Defendant denies that he was at-fault but jury finds him 100% negligent and awards $70,000. Williams v Barnett (Pennsylvania 2018) $60,000: teenage boy is riding his bicycle through a bust intersection in Pottstown, Pa. when defendant suddenly accelerates into the intersection and hits the boy. The boy suffers a concussion and some cuts and bruises. His parents sue the driver who fully admits fault. They quickly settle the claim for policy limits of $40,000 and get an additional $20,000 in UIM benefits from their own insurer. Valentino v Shields (Pennsylvania 2018) $125,000: female plaintiff gets rear-ended by defendant near Erdrick Street and Teesdale Street in Philadelphia. She alleges various injuries including cervical & lumbar sprains, disc herniations with radiculitis, right knee contusion and headaches. Defendant denies fault and insists that plaintiff actually made the collision inevitable. The jury finds plaintiff was 25% at fault and awards $125,000 which is reduced to $93,750 based on her 25% share of negligence. Avery v Spadafora (Pennsylvania 2018) $18,375: plaintiff is driving in a funeral procession on Interstate 376 in Carnegie when defendant cuts into the procession and rear ends her. Her injuries are limited to a concussion and cervical sprain. Defendant completely denies liability but jury in Allegheny County finds him 100% at fault and awards $18,375. Portfield v Roth (Pennsylvania 2018) $30,000: 42-year-old plaintiff is on Memorial Boulevard in Bullskin Township when defendant driver falls asleep at the wheel and rear ends him. He suffers torn rotator cuff requiring surgery and cervical disc protrusion. 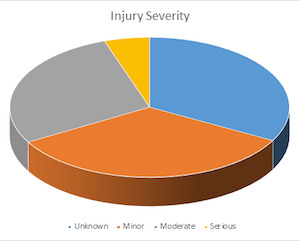 Liability is admitted but the extent of the injuries are in dispute. The case is submitted to arbitration in Westmoreland County and the arbitrator awards $30,000. If you need an auto accident lawyer in Pennsylvania, Miller & Zois can help. Call us today at 800-553-8082 or request a consultation online.